A candle light vigil was held for Sean Smith-Arlt at the Town Clock in Santa Cruz on October 22, coinciding with the 21st annual National Day of Protest to Stop Police Brutality. Sean was experiencing ongoing mental health issues when he was shot and killed on October 16 by officers with the Santa Cruz Police Department, who say he was advancing towards them while holding a garden rake when they deemed him a threat. A close friend of Sean's family spoke to the large group present at the vigil. "People have spoken about Sean's artistic ability, but Sean had the right brain cone as well," he said. "We used to sit sometimes and talk about Plank's Theory. Sean had quite an incredible mathematical mind, as well, so he had both the right and left brain working." "He had quite an incredible intellect, and he had quite a sense of humor to him as well," he added. He mentioned how he and Sean's family had taken a walk together in Pogonip the morning of the vigil. "They are like family to me," he commented. "They don't want to be angry. They don't want you to be angry, even though I'm sure that will come," he said. "They simply want to see that Sean's child is cared for in the future, and that the community is respected, and that in the future things like this don't happen." "I can tell you it has been very difficult, but they are incredibly loving people, and they love this community, and they want you to try to remember that," he said. On October 18, Sean's family released a written statement to the public that describes how dear Sean was to them, and what type of person he was and what some of his accomplishments were. His family confirmed Sean was suffering from mental health issues. "It is clear more training and resources are needed for responding to a mental health crisis situation," the family said in the statement. They have called for a more independent investigation into the killing. "The information that has been released so far is not telling the whole story. We are hopeful that with a more independent investigation, the entire truth will come out and justice will be done," the stated read. Community activist Sherry Conable spoke about the need for a truly independent investigation into the killing when she spoke at the vigil for Sean. "There is a very strong relationship between the District Attorney's office and law enforcement officers," Conable said. "They kind of depend on each other to prove their cases, and make their cases, and that is not an objective review of what happened." "We need an outside, independent investigation of what happened," she explained. "Not from the District Attorney's Office. That will not be independent. That is an insider's investigation, that is not adequate." "It is incumbent that the mayor and our council members call for, and be willing to pay for, an outside, independent investigation," Conable said. Brenda Griffin, Vice-Chair of the Santa Cruz Chapter of the NAACP, spoke at the vigil on behalf of the Social Justice Alliance of Santa Cruz, a recently founded coalition of organizations working together on issues of police accountability and transparency. Participating organizations in the alliance include the NAACP, ACLU, Barrios Unidos, RCNV, SCCCCOR, SURJ, and representatives from the Santa Cruz County Youth Violence Prevention Task Force. "Our hearts and prayers go out to Sean's family. Our hearts and prayers go out to our community, and our hearts and prayers go out to other communities who have gone through this, and it just has to stop," Griffin said. As she spoke, Griffin was accompanied by Peter Gelblumm, Chair of the Santa Cruz ACLU. They invited those at the vigil to attend a listening session the alliance has organized for November 1 to be held at Peace United Church. "This listening session is an opportunity for the community to gather and share their feelings and concerns about the recent death of Sean Smith Arlt and begin the communal healing process," an announcement for the event states. Sarah Leonard, Executive Director of the Mental Health Client Action Network of Santa Cruz County (MHCAN), also spoke. "This happened here because the culture here made it possible for this to happen," she said. Leonard compared how Santa Cruz police responded to Sean's erratic behavior to a recent incident in Great Britain that made international news when police disarmed a person with a machete. "They took the time and the effort, and they had the cultural reasons for valuing that and making that happen," Leonard said. Abbi Samuels and Keith McHenry of Santa Cruz Food Not Bombs helped organize the vigil. Santa Cruz Food Not Bombs shares food outside of the post office in downtown Santa Cruz on Saturdays and Sundays. Volunteers with the organization have become some of the most vocal of those advocating locally for low-income and houseless people. McHenry spoke about how the police have been responding to the homeless community in Santa Cruz. "We see so much suffering at the hands of the local police under the direction of the city council and the city manager's office," he said. Samuels read some of Sean's poetry, as well as from his book, "The Love Manifesto." "The Love Manifesto delivers a psychological, political and spiritual message that is capable of addressing the concerns of readers from nearly every cultural while simultaneously promoting a cosmopolitan philosophy that is capable of bringing peace to the world." 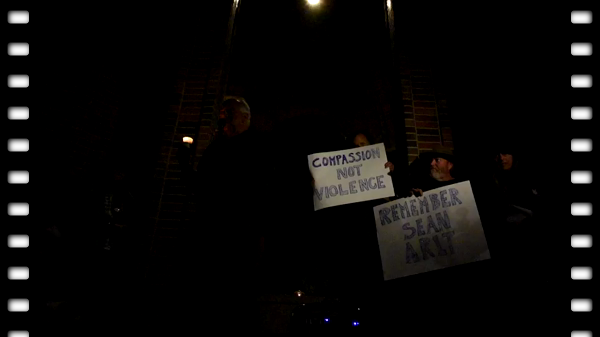 Local religious leaders also helped organize the vigil for Sean. Reverend Dave Grishaw-Jones of Peace United Church, leaders of the Santa Cruz Zen Center, and Rabbi Philip Posner provided prayers and words of solace to those in attendance.